The weather is a big deal around here. Even a few degrees one way or the other can change everything. 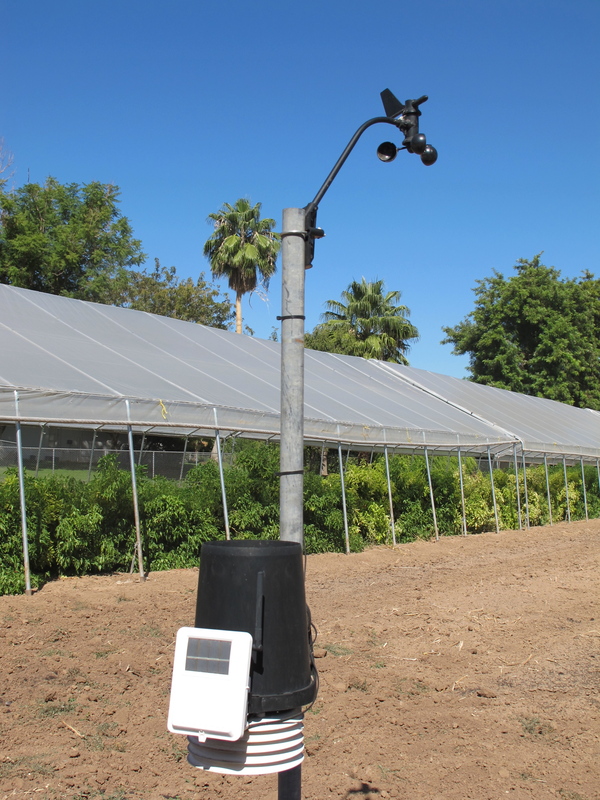 The temperature is the key to when we plant and what, when we pick, whether we need shade, frost cloth, or water. We are fortunate that in our climate the temperature allows for us to have a growing season longer than most parts of the country; however, it can work against us too. To say it is watched closely is an understatement. Bob is a little weather-obsessed. 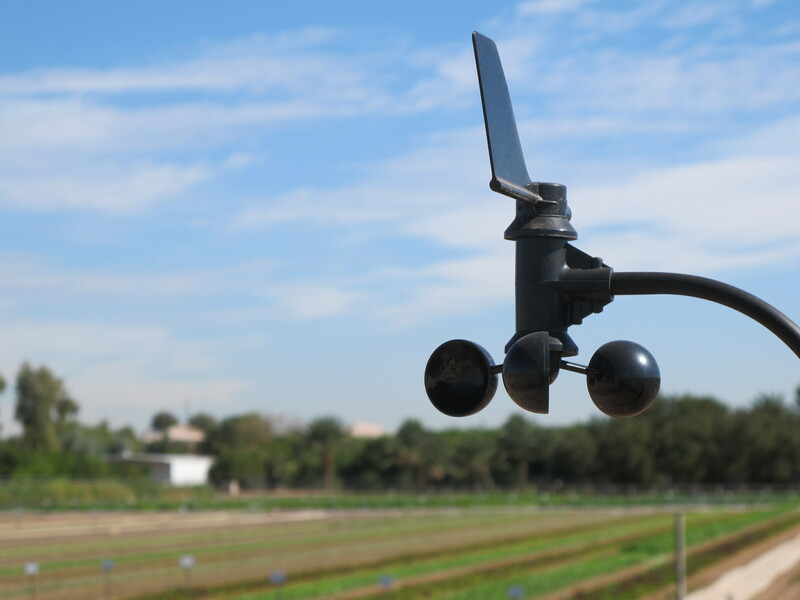 We have four wireless weather stations strategically located around the farm so that we can monitor the temperature at all times. 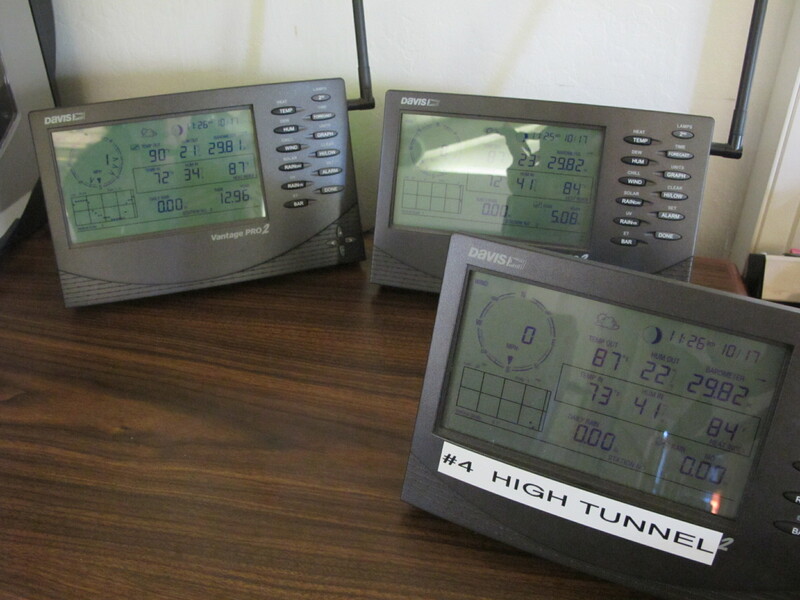 We have one weather station in the high tunnel, one in the north field and one in the south, and another in the front garden. It would seem that one thermometer could tell you all you need to know, but that is not the case here. We have found over the years that some areas of the farm are colder or warmer than other areas. We have also found that with a little creativity, we can create climate controlled areas to help us get through the seasons without some of the damage that can come with extreme temperatures or things like wind, hail, frost or sunburn. The high tunnel was built two summers ago for just such a purpose. The tunnel, at 300 feet long and 16 feet high, has helped us through the summers, with temperatures inside never going above 100-degrees, even on a 115-degree day. 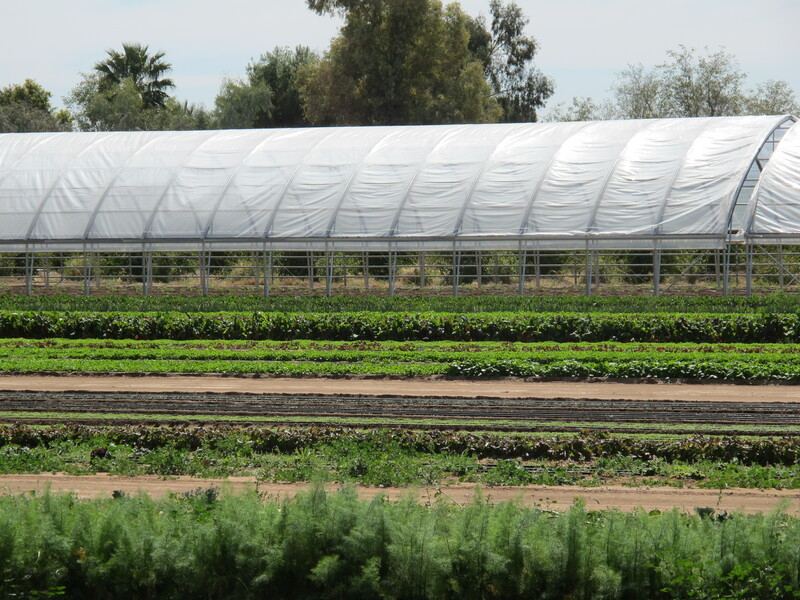 The shade cloth across the top can exclude 40% of the sunlight, to keep plants from being burned, while the sides can be raised to allow the air to flow through. 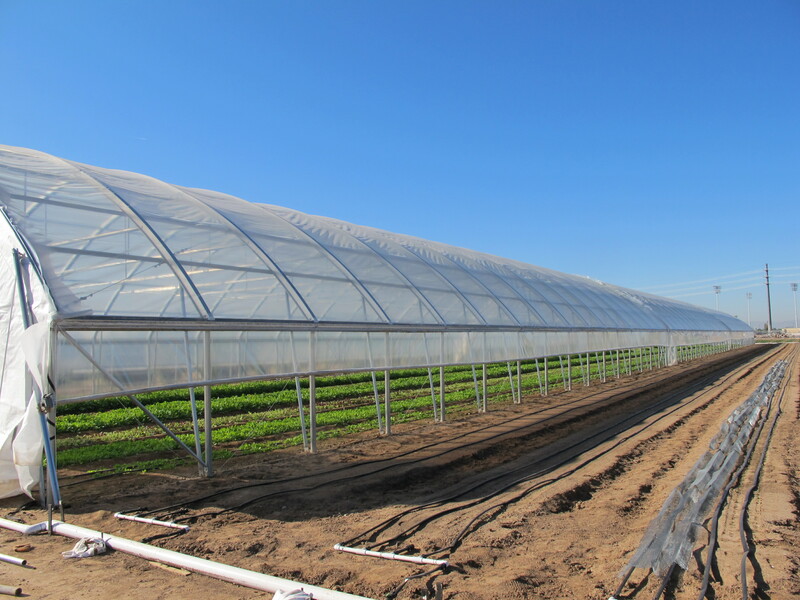 During the winter, the high tunnel can be completely sealed off, so that the temperature never goes below freezing. We were able to harvest beautiful baby leaf greens in it last winter, days after a hard freeze, without seeing any damage. The shade houses in the front garden do the same. We are strategic with where we plant. Lettuces and arugula can handle a light frost, but a heavy frost will burn them. Some are planted outside of the houses, when we know that we can harvest them before the weather turns. 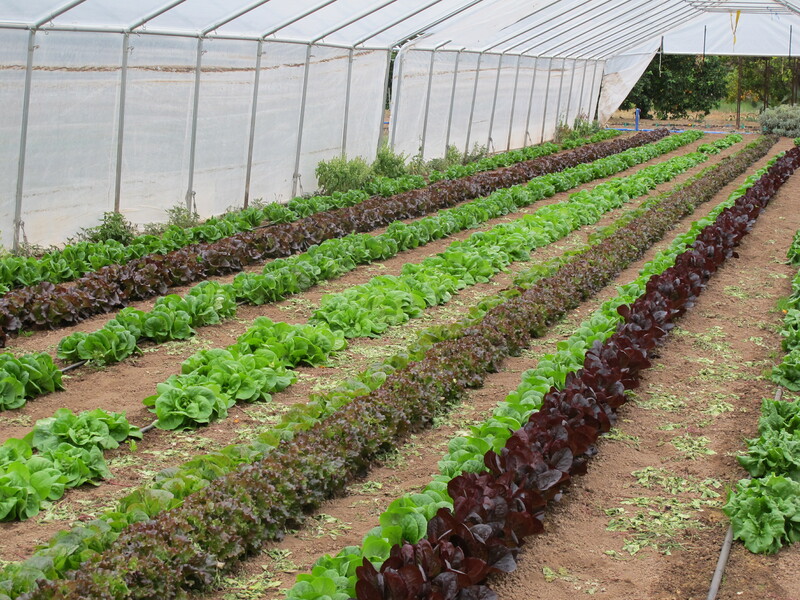 Other are planted inside the high tunnel or shade houses, so that we have greens to harvest after a frost. Broccoli, cabbage, cauliflower, kale are all fine out in the fields during a frost. Root vegetables that are deeper into the soil, like rutabagas, carrots and beets are also able to handle dips in the temperature; however, if it gets cold enough to kill the tops of the beets, we have cause to worry. Root vegetables that are not as deep in the soil, like radishes, are more sensitive and will turn clear inside. It is a balancing act that we watch carefully. Frost cloth helps protect down to 26-degrees, but beyond that there isn’t much that can be done. Although a freeze isn’t always a bad thing. 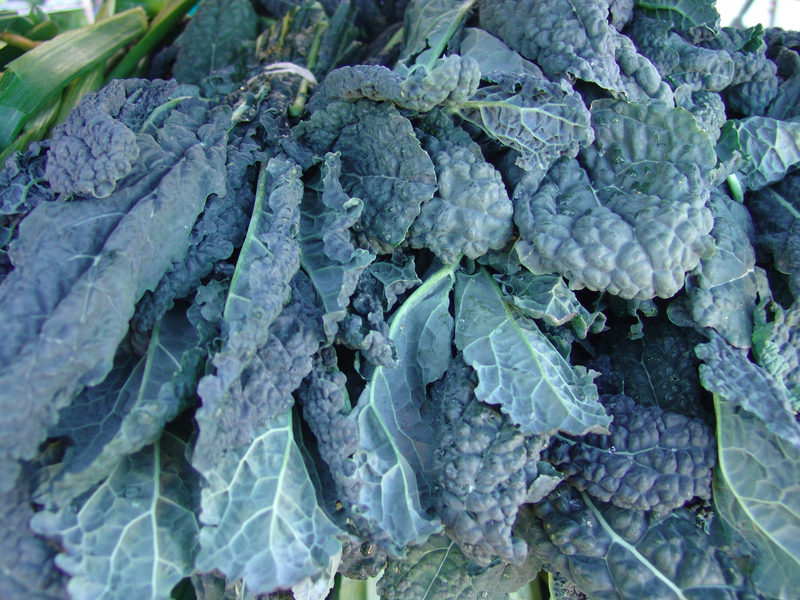 Some chefs won’t put kale on the menu until the kale crop has gone through the first frost of the season, believing that the frost enhances the flavor of the kale. 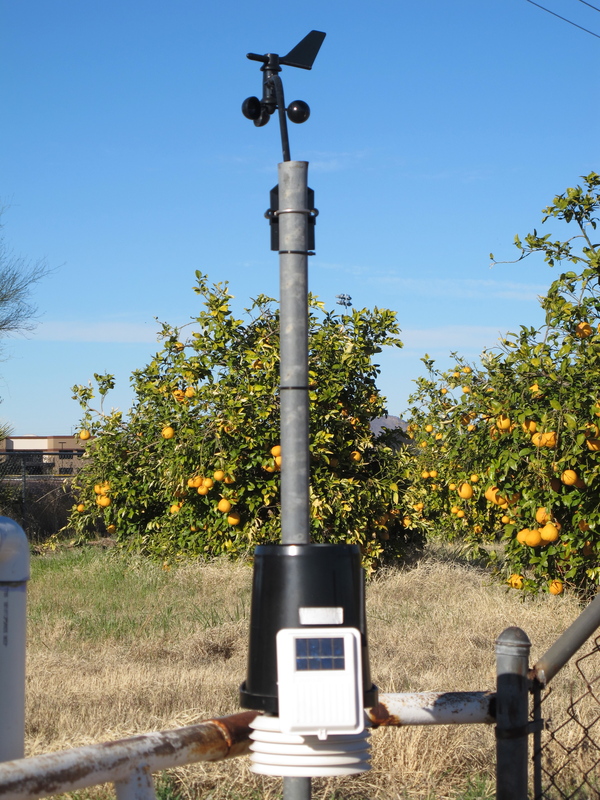 The weather stations on the farm are part of the Davis Weatherlink Network, which is a network of similar stations across the country that can be accessed and monitored online. 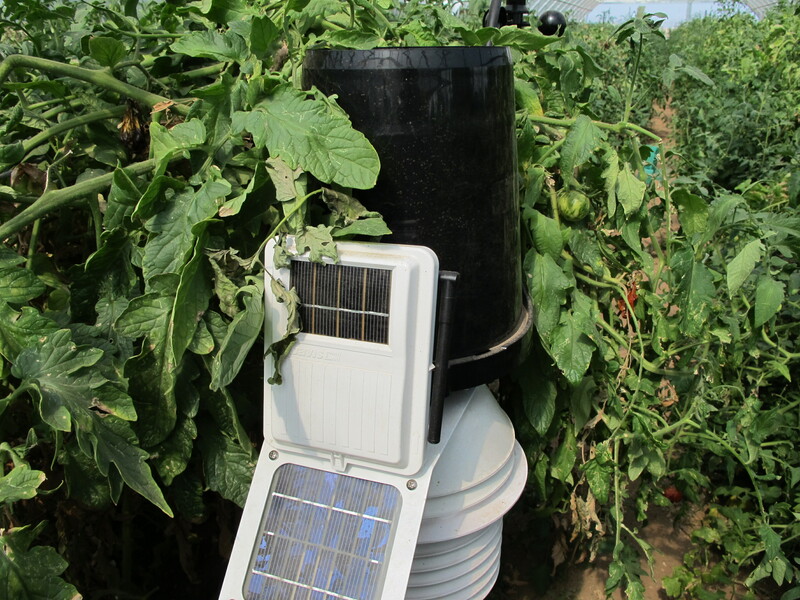 All of the weather stations are also equipped with a rain gauge (the black bucket) to measure rainfall and a spinner on the top for wind speed. You can access the weather data from our stations or from others in the network via a free app available here. Then you too can weather obsess along with Bob. It’s always interesting to learn new things about how the McClendon family brings food to the farmer’s market. I appreciate how “weather” obsessed Bob is because our family has come to rely on the produce and products you bring us every week. I shared with Sean how much I enjoyed reading the blog, thought I’d share that with you too, since you write it 🙂 As always, thanks for keeping us informed about the goings on at the farm.